Dennis - A Treasure Hunt Adventure is written and illustrated by Pete Underhill. It is published by Piranha Studios and was officially launched on 1 September 2005. It was solved almost exactly a year later. The hunt takes the form of an illustrated book (priced £14.99), and two websites. Whoever solves the clues in the book and using the Bad Taste Bears website, will be led to a 24ct gold bear figurine, worth £10,000, hidden somewhere in the UK. In Pete Underhill's illustrated story, Dennis, is a mascot attached to the front of a disused dustcart, lying in a scrapheap. He is rescued by a rat who takes Dennis on a journey through the sewers and skies of the local town, to find his true home. The author, Pete Underhill, and publisher, Piranha Studios, are the people behind the 'Bad Taste Bear' collectible figurines. 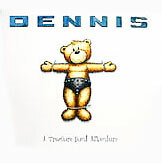 (Note: by their very nature, Dennis, and the Bad Taste Bears may be unsuitable for very young children). A launch event was held at the Piranha Studios' Newcastle HQ on Saturday 6 August 2005. Tickets were available to the public and visitors could claim their advance copy of the hunt. Additionally, advance orders are being taken on the official website, and will be shipped on 15 August 2005. The book was generally available from 1 September 2005. The official Dennis website carries full details of the hunt including an opportunity to order the book. The related Bad Taste Bears website will need to be visited at some point in order to solve all the clues.